This book was recommended by Connor Timmons of Starksboro. 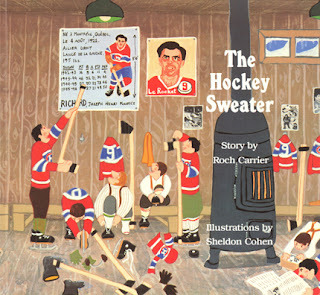 It is a caricature of a traditional childhood in Quebec. It's a child's view of the rivalry between teh Montreal Canadiens and the Toronto Maple Leafs that typifies Quebec's relationship to the rest of Canada. The movie short is available online here. This book is available downstairs in the Kids' Kiosk at Lawrence Memorial Library.